A live cell stays alive if it has two or three live neighbors. A dead cell becomes alive if it has exactly three live neighbors. An animation of Gosper’s Glider Gun in action. 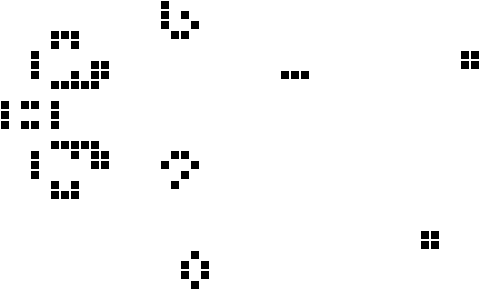 For our Statistical Computing course, Chris Genovese used the Game of Life as an example at the very beginning of the course to illustrate the flexible design of programs. Students first were told to write an ordinary implementation following the rules above – then asked how they’d abstract their algorithm so they could replace the rules or even work on a non-rectangular grid. Without careful planning, that kind of abstraction could be very difficult. So here’s a sample implementation in Racket, my favorite little Lisp. First we need to specify the rules of the game. Conway’s rules are the most popular, but it’s possible to use different rules to decide which cells live or die, so we’ll abstract the rules out to a function. If we want to try out different sets of rules, it’s easy to define entirely new functions – with arbitrary logic and complexity – which can replace conway-rules. As you’ll see below, conway-rules is passed as an argument to our other functions, so replacing it requires no source code changes at all. It’s tempting to store the state of the Game of Life using some kind of two-dimensional array or matrix. Then, on each step, we’d loop through the whole board, checking which cells should live or die. But this would become slow – the gliders we saw earlier can wander off arbitrarily far, so our board would have to be large and the loop slow. If our board isn’t large enough, cells could reach the edge, and we’d either need to increase the board size or accept that their behavior will be wrong. Worse, the amount of computation needed would grow with the board size, regardless of how many cells in the board are actually alive. In the worst case, we’d have an enormous board of entirely dead cells, and at every step we’d still loop through the whole thing checking if anything should come alive. But look back at the rules. All we really need to keep track of is the live cells. We can tell if a cell comes alive just by knowing if it has live neighbors. Imagine we have a list of currently live cells. If we find the neighbors of each live cell, we’ll have a big list of coordinates; if a cell is the neighbor of three live cells, it’ll appear in that list three times. So, for example, a currently dead cell which is the neighbor of three live cells will appear in the list, and we can mark it as alive on the next step. Coordinates are stored as (x, y) pairs. We loop through perturbations, adding or subtracting 1 from x and y, generating the eight neighbor coordinates. hash-update takes a hash table, looks for a key (item), and updates it according to the function passed to it – in this case add1, so the count is incremented by 1. If the key doesn’t exist, we pass 0 to add1 as the default. As a result, we have a count of how many time each item appears in the neighbors list. The hash-ref simply looks up the cell in the table, returning how many neighbors it has. Our step function only runs one iteration: it applies the rules, generates the new set of live cells, and returns it. How do we run the Game of Life for more steps? A simple route would be a for loop. But we can be fancier. Racket supports lazy sequences: infinitely long sequences whose elements are calculated only when we ask for them. We can define one recursively. stream-cons is an interesting function that works recursively. It defines a stream (a sequence) that begins with cells and whose next element is formed by calling its second argument – which creates another sequence that starts at the next step. In summary, life applies Conway’s rules on a rectangular grid, making an infinite sequence of cell states. We can ask Racket to provide any element in the sequence and it’ll be calculated on demand. The acorn configuration after fifty steps. The acorn configuration after 100 steps. One more thing. Previously we defined a neighbors function, which gets the list of neighbors of a cell. That function assumed we were working on a rectangular grid. But, if you look carefully, you’ll see it’s the only function which assumes that. If we want to change the grid, we need only swap out the neighbors function. By swapping out neighbors-rect for neighbors-hex in our definition of life, we can work on a hexagonal grid. No other code needs to change except for how we draw the grid. 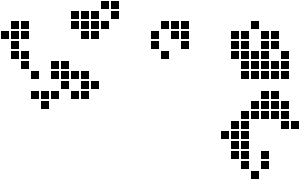 A flexible implementation of Conway's Game of Life by Alex Reinhart is licensed under a Creative Commons Attribution 4.0 International License.